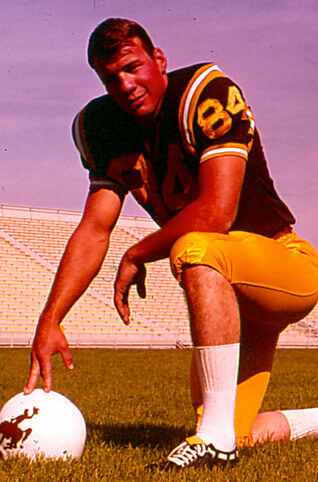 Jerry DePoyster became the most decorated kicker in Wyoming football history during a golden age of Cowboy football. During his great career, he did both the punting and place kicking for the Cowboys when they won two Western Athletic Conference championships and earned two bowl bids including their greatest bowl of all time, the 1968 Sugar Bowl. While he was an outstanding punter for the Pokes, DePoyster’s claim to fame was his ability as a place kicker. He was an Associated Press and Sporting News All-American in 1967, his senior season. He held at least six NCAA records including most field goal attempts in a career (93), average field goal attempts per game during a career (3.10), most field goal attempts of 50 yards or more in a single season (17 in 1966) and most in a single game (3 vs. Utah, Oct. 8, 1966). He led the team in scoring all three years of his career, and led the WAC in scoring in 1966 and 1967. During his junior season of 1966, he led the nation in kick scoring with 71 points. In Wyoming’s 1966 game against Utah, he made field goals of 54 (2), 52, and 21. In that game, his 54 yarder was the first made field goal of 50 yards or more in school history. His 55-yarder against CSU was a school and Western Athletic Conference record at the time. During the Sugar Bowl season of 1967, he accounted for three victories with his leg. He kicked two field goals in the Sugar Bowl. DePoyster also was an outstanding punter for the Cowboys. He punted 62 times in his career for a 41.7 average. He was 12th in the nation in punting during his senior season of 1967. He was drafted by the Detroit Lions in the second round of the 1968 NFL draft. He played professionally for Detroit and the Oakland Raiders.